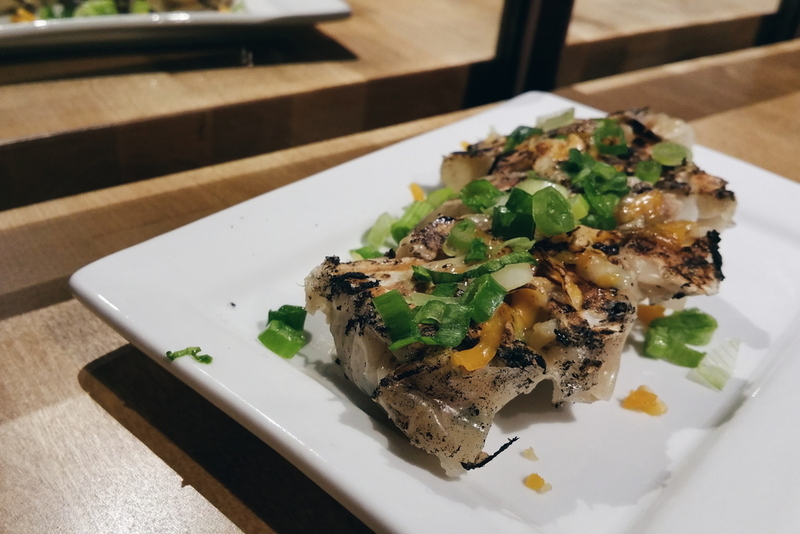 My first post of 2015 welcomes the new The Ramen Butcher, a Chinatown ramen shop opened by the Japanese ramen god Menya Kouji, to the Vancouver dining scene. To be honest, I never felt too confident about the choice of location for many Chinatown eateries but recently, the continued success of Phnom Penh, Matchstick, and the well received Crackle Creme gives me confidence that non-downtown restaurants can flourish as well. With that, location shouldn't lag this newcomer behind long time favourites such as Santouka as long as they can keep up with quality. 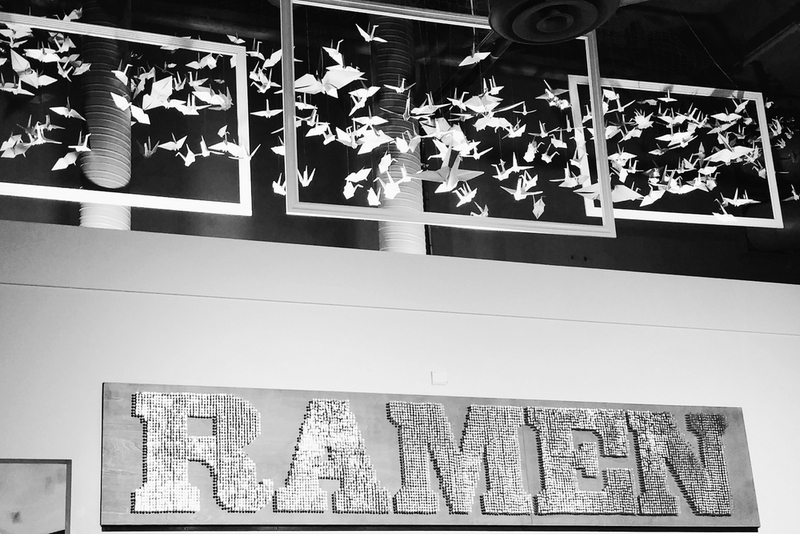 So let's get on it shall we; a look at the much hyped Ramen Butcher on grand opening day.. The gyozas at Ramen Butcher are pretty good, better than Gyoza Bar's for sure. The skin is thin and soft but lightly cripsy on areas that are seared while the filling is soft, warm and packs in a lot of juice that you would expect out of a gyoza. This version of gyoza is topped with katsuobushi (bonito flakes) and a light soy sauce which I guess mimics okonomiyaki in a way. I quite enjoyed it but +$1 per small gyoza makes my wallet a bit sad. This gyoza is the same as the okonomi gyoza but is instead topped with melted cheese. I personally favour the okonomi more but my friend enjoyed this Western twist. Noodles: the thin, round kind you'd get at Santouka but less chewy. I personally like the thicker kind for the added amount of chewiness but this thin type wasn't too bad. Soup: smokey and roasted. When they say roasted garlic oil, they mean REALLY roasted like something-almost-burned-in-your-soup roasted. Don't get me wrong, I love smokey, roasted flavours but this was almost too much for me and in the end, I couldn't enjoy my soup as much as I would've liked to. The Extras: The chashu (fatty) here is some of the best I've had on top of a ramen..no joke. It's ultra juicy with all the fatty goodness but still has a crunch from all the searing it goes through. 10/10 for me! The egg on the other hand was only ~6/10 just because I would've liked it more marinated and cooked less for a runnier yolk. Soup: thick and mildly salty - tastes like a typical nice miso soup base. I definitely liked this soup more than the black since it packs a lots of flavour that I feel goes better with the noodles. irst things first, congratulations on your grand opening, Ramen Butcher! However, I feel like it'll take a few more visits for me to really put this place on my list of to-gos. I'm not saying the food here isn't good - I enjoyed it but I didn't fall in love with it. Oh but one thing I want to point out is the FREE KAEDAMA aka. one free noodle refill...and the thing is that they don't refill 1/2 or 3/4 of your original noodle amount, but the same if not more noodles. What a plus. For that reason, I think the price on the ramen is understandable. I like the atmosphere here though it lacks the traditional "home-y" feel of most Japanese ramen restaurants in the city. I'll come back when I need another crazy filling bowl of ramen under $12 and don't need to wait in line for 30+ minutes to get a spot.